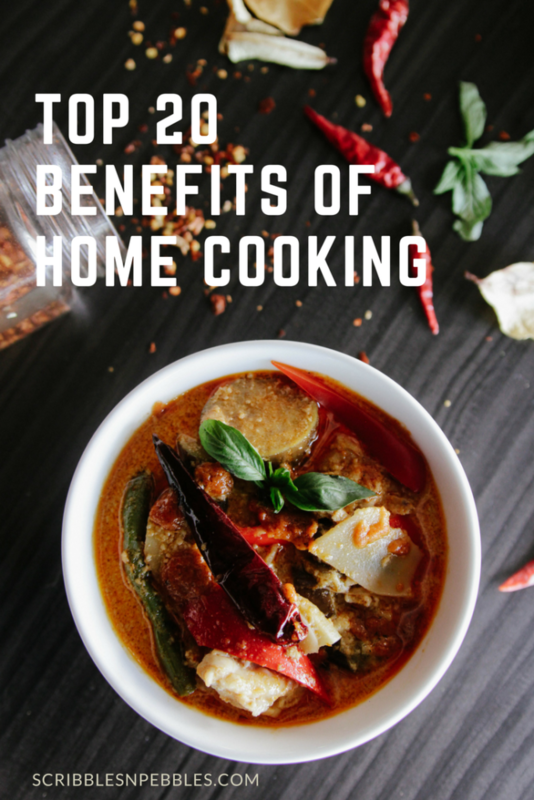 Top 20 benefits of home cooking: Why you should start cooking at home? Today, I am sharing you the benefits of home cooking. I love cooking as much as I love eating. I think home cooking is the best way to have the food in the best way you want. Cooking is more than just a hobby, and not everybody entertains cooking. Home-cooked meals are always worth the hassle of making them. In fact, the hassle is more fun and healthier if you do the cooking with your family and friends. There is no doubt that home cooked meals are always healthier than the restaurant foods. When cooking your own meals you are in charge of what to cook and how to cook. You will use freshest ingredients and more natural ingredients than the processed ones. According to the research of Johns Hopkins Bloomberg School of Public Health, people who frequently cook meals at home eat healthier than who don’t. Forget the never ending controversy over whether eating out is cheaper or cooking at home is. Home cooking is the best option if you want to save some money. Raw ingredients cost cheaper than the prepared meals, taking the amount into account. With the money you pay for 1 fast food burger, you can get raw ingredients enough to make 2-3 burgers in your kitchen. Preparing meals at home and eating gives you the valuable family time in today’s busy schedules. You share love and happiness when you include your family members, mostly children while preparing your meals. Eating together gives you time to talk to each other and you will be teaching your kids healthier eating habits while preparing the meals. You will definitely learn to appreciate the food you eat when you prepare and cook your own meals. And this is really important in these days when we go for mindless munching & eat out of stress. When you prepare your meal you will be aware of what you are going to consume and this will save you from the eating disorder. Home-cooked meals are healthier than the restaurant or street foods because they are more clean and hygienic. When you cook in your kitchen, you are aware of the cleanliness of the ingredients as well as the kitchen utilities. Even if the raw ingredients you buy in the grocery may be contaminated, you will wash them thoroughly before using them. Restaurant foods or the packaged foods can never come as equal to home cooked meals when nutrition is taken into account. When you prepare your meal you can use the organic ingredients, less artificial flavor and cook in a way that preserves the nutritional values of the foods. Eating more at home will definitely minimize the calories intake than eating outside. You can always customize the portion as required when you eat at home. Restaurant foods are big in portion but less nutritional value. People nowadays are indulged in overeating because the portion sizes offered by restaurants are just too big than necessary. But when you cook at home you can fix the right sized portions for you and your loved ones. When preparing meals at home you will have full control over what ingredients to use and this means you are in charge of which ingredients not to use at all. So you can avoid certain ingredients like peanuts, gluten, and shellfish to which many people have allergies. If anyone of your family members and friends or even yourself have such allergies, you can always reduce the risk of allergies if you cook meals at home. There are rarely any cases of getting poisoned by food if the food is being prepared at home. Food-borne illness or so-called food poisoning is very likely to happen when you eat out. But at home you will use the fresh ingredients, clean utensils, cook the food thoroughly, store at correct temperature which prevents the food poisoning. Salt & trans fats are two ingredients that make the food tasty. Restaurant foods or any commercially prepared foods are like yummmm but they offer much more calories and an abundant amount of salt & fat. But when you prepare meals at home, you can always choose to use salt with less Sodium and oil with zero cholesterol; both in the lesser amount. Cooking your meals at home helps you save money but it also helps you save time. When you prepare meals at home, you get more organized every time. If you make the weekly meal plans, you will have a shopping list of what you need for a week and you will get everything from one visit to a grocery. This saves the time of frequent visits to a grocery. Also in the time, it takes for you to go to a restaurant, ordering a meal, waiting for the order, eating or taking the meal home, you can prepare your own fresh and healthy meal in much lesser time. Kids these days are inclined to the unhealthy lifestyle of eating fast and junk foods while playing Xbox. You can teach your kids more healthy ways of living; involve them when you prepare meals. They will be eating more healthy meals and share things with you while eating. They will learn about different type of foods and nutrition that they are getting from them. You will have the full control over your food at home. You will have the options of various brands of certain foods. You can choose the ingredients and the amount of certain ingredients in your meals; you won’t get these choices at restaurants. For example, you like your burger with less mayo, more cheese, and no tomatoes. When you make a burger at home you can make accordingly but at restaurants or fast foods, you might not have your kind of burger. Eating is not always about satisfying your palate nor is it about calming the growling stomach. The food you eat may make you fall sick or help you get better when are sick or some can cause death. Preparing your own meal will increase your knowledge about food. You will know the seasonal foods, off-season foods, food that heals, food that kills, and you will learn to combine the ingredients to prepare the meals that are tasty in more healthy ways. Home cooked meals are not only healthier but also tastier. When preparing meals at home you tend to use fresh ingredients, more of organic and local grown produce rather than artificial flavor and color, and the right amount of everything you want. This way you prepare the meal that pleases your palate and same goes when you cook for your family and friends as you will cook to their preferences. Cooking is not an easy job. Really. It’s like working out in the kitchen. You will be spending all your time standing, going t and fro, reaching out for things in upper cabinets when you are cooking. Then there is grinding, whisking, continuous stirring, pounding, kneading, cutting and much more that requires energy. Hence, the more often you cook at home, better the chances of having toned arms and legs without going to aerobics or gym. If you start cooking yourself on regular basis, your knowledge about food will keep on increasing. You will know ‘x’ ingredient is the best to use with ‘y’ ingredient, the ways of cooking certain ingredients enhance their taste, you can follow somebody else’s recipes but with a little twist of your own. In this way, you can experiment with the recipes and create your own new recipes which you can share with your friends and family. A study has shown that kids, teens, and grown-ups who frequently eat at home have more healthy mental state than those who don’t. You can always cook away your stress; of course, cooking won’t uproot your stress but it definitely helps to take your mind away from it. You can also discuss your problems at your dinner table and suggest each other. There are some arguments about proportions of home-cooked meals and weight gain. Some say that you tend to eat more as home-cooked meals are tastier resulting weight gain. But in the larger picture, home-cooked meals keep your waistline in shape. People who eat out (restaurant foods and junk foods) more often tend to be obese than who eat more at home. You include more fruits and veggies in your diet and less salt and fats. Home cooking is always more about using fresh and local grown produces rather than packed and processed ingredients. When you reduce the use of such industrially prepared food, you will automatically minimize your share of carbon emission, reducing your carbon footprint. When you cook more at home, you tend to use freshest ingredients; hence you might start your own kitchen garden for fresh produce. You will use your degradable waste for compost which will gradually reduce your share in creating waste. The above-mentioned benefits should positively tempt you to start your home cooking. The time has come for us to get back to our kitchen, eat the meals that we prepared ourselves and live a healthier and happier life. Here are some easy and tasty recipes that you can easily prepare in your kitchen.